It’s been a rough year suffering from miserable menopause symptoms. I have gained a lot of weight, I am always cranky, my skin has started to drastically age, my hot flashes hit me every few hours, and I feel like no one understands what I am going through. I am not in the “giving” mood this year, freaking out that I won’t get through my holiday “to-do” list, and feeling stressed out. The responsibilities during the holidays can be difficult with 99 percent of all women experiencing stress and panic attacks this time of year. Throw in one of the biggest transitions of your life, menopause, and it is no surprise you are freaking out, not in the “giving” mood, and feeling stressed out. First, let’s address your physical menopause symptoms. Weight gain, irritability, skin changes and hot flashes are all symptoms of fluctuating hormones. Make an appointment with your doctor to discuss your symptoms and possible treatments. Once you decide on a program to treat your symptoms, you will hopefully start to feel better. Going through physical changes can be stressful. Second, menopause usually happens as the natural aging process kicks in. If you’ve practiced a lifetime of poor eating choices and lack of exercise, it’s unforgiving during menopause. Now is the time to start eating nutritiously, exercising regularly, and dedicating time to pampering. Regarding your skin, treat yourself to a holiday makeover. Visit your favorite make-up counter. A new cleansing/moisturizing program may restore your radiant complexion. Visit your practitioner to discuss symptoms. Start eating a healthy diet and exercising. Make time to pamper yourself. If you practice a few of these Stress-Free Holiday Tips you may just survive your “to-do” list and the holiday season. 1. Keep expectations reasonable. Planning parties and decorating are stressful tasks. Instead of planning a big holiday party, plan a day to celebrate the holiday at the spa with your closet friends. Keep your schedule open to attend a few parties, not give them. Instead of decorating your home and a Christmas tree, put a lovely wreath on the front door, place a small-planted evergreen in the living room and enjoy red candles around the home. 2. Communicate with your loved ones. Let them know you are going through changes, and that you plan to get some rest this holiday and would appreciate their support. 3. Limit your alcohol intake. Holiday parties are often centered on drinking. Try to “nurse” one glass of wine for the evening. Remember alcohol is loaded with extra calories. I ask for “water on the rocks with a twist” – it is fun, always gets a reaction, is calorie free and keeps you hydrated. 4. Quiet time. Plan a half hour a day to sit quietly. Find a spot in your home in a comfy chair. Close your eyes, and take long deep breathes. Breathe in thinking of good health and happiness and breathe out stress and frustration. 5. Eat a healthy diet. Eat more vegetables, whole grains, fruits and low-fat foods. You will have more energy. 6. Start exercising. Take a 30-minute walk. Not only will you burn calories, you will feel more relaxed. 7. Manage your time. Cut your to-do list in half this year. 8. Send e-cards this year. It is fast, easy, free and fun. This will save you time, money, paper and postage. 9. Have a sense of humor. Dealing with relatives over the holidays can be stressful. If relatives are visiting you for the holiday, ask them to book a hotel for their stay. Keeping your home a sanctuary during your menopause transition is important. If a relative is driving you crazy, try to be cheerful and laugh it off. 10. Keep a budget. Dealing with extra holiday expenses is also extremely stressful. To buffer this a bit, try making homemade gifts or let your loved ones know that this year the gift theme is ‘to spend less than $20 per person per gift’. Don’t forget, shopping on-line will save time and frustration at the malls. 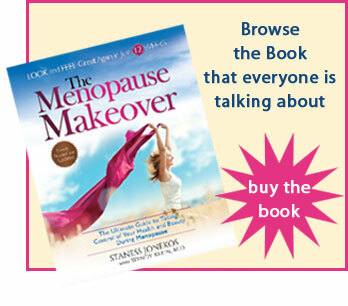 Remember menopause is a natural transition. The holidays can be a joyful time if you embrace your changes and make a few holiday stress-free adjustments to your agenda. The greatest gift you can give…. is to take care of yourself, and when you do, you will want to give to others. A less stressed Dear Crabby wishing you a Happy Holiday! Write to Dear Crabby and get advice about your menopausal symptoms. Dear Crabby has tips to make your life easier. She wants to hear from YOU. This entry was posted in hormones, emotions. Bookmark the permalink. « Suffering from hot flashes?